Discussion in 'Contrails and Chemtrails' started by Mick West, Feb 12, 2015. People who believe in the "chemtrail" frequently have several misconceptions about contrails (the trails of clouds sometimes left behind airplanes). The most common misconception is that contrails always quickly dissipate, and can't persist and spread. But there are several other misconceptions - like how contrails with gaps should be impossible, or that other phenomena like colored contrails, or contrails happening ahead of weather changes, or circular contrails, are suspicious. 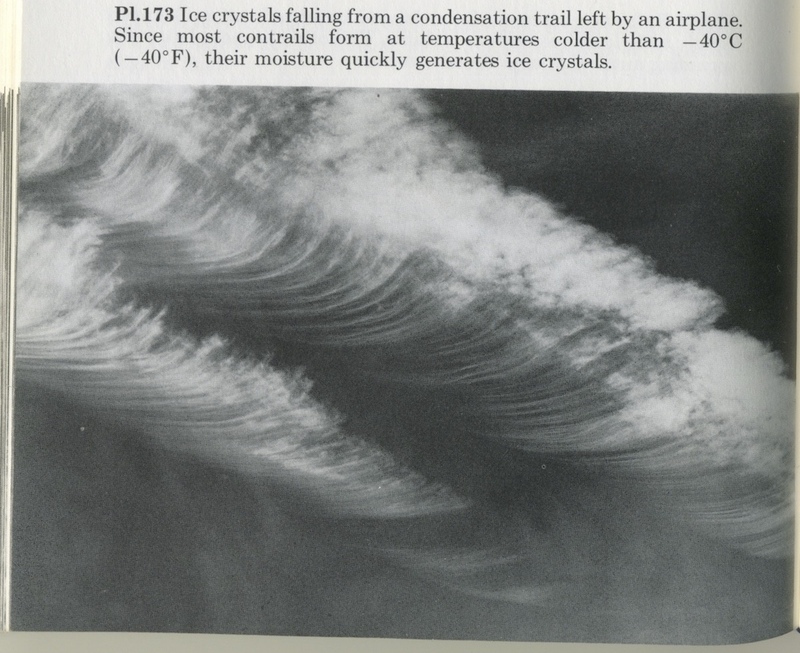 The best tool I've found for explaining contrails to people has been old books on clouds. 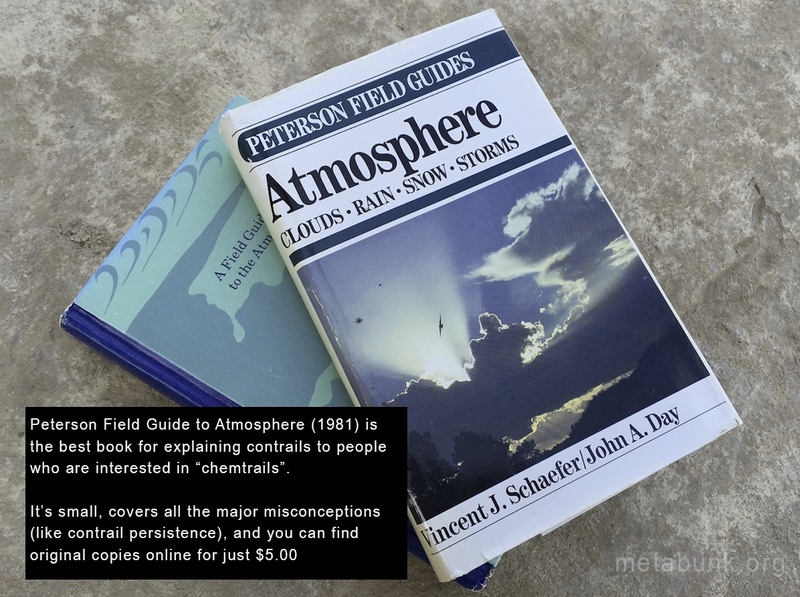 I've got a large collection of these myself, but if I were to pick one for someone to show to a friend or relative, then I'd pick the 1981 book Peterson Field Guide to Atmosphere. In this era of high-flying aircraft, condensation trails —contrails— are a commonly observed feature of the sky. Sometimes they are ephemeral and dissipate as quickly as they form; other times they persist and grow wide enough to cover a substantial portion of the sky with a sheet of cirrostratus. Sometimes they maintain their initial integrity as a line of cloud formed in the wake of the rapidly moving aircraft: at other times they develop a series of pendules from which streamers of precipitation are observed to fall. 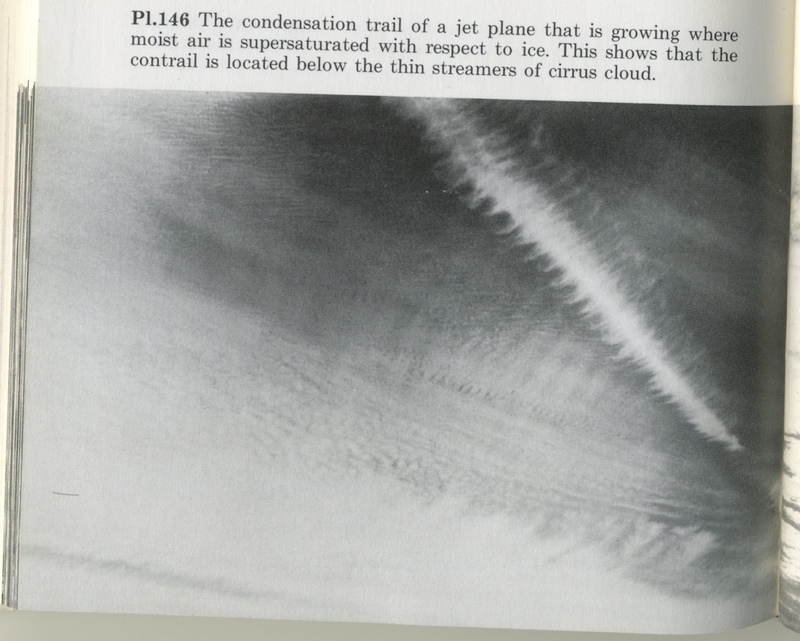 Contrails are a fascinating subject for study, sufficiently complex to challenge the expert and sufficiently variable to intrigue the amateur observer. Properly understood they yield a wealth of information about the current state of affairs in the high atmosphere, where it is difficult in locate weather instruments. Observed systematically, as a function of time, contrail information is a valuable adjunct to forecasting the weather. Chapter 2 explained that a cloud forms when the moisture content of the air at a particular temperature exceeds a critical amount and that this condition can be attained in 2 ways: (1) adding water vapor to the air from an external source, or (2) cooling the air, thus reducing the amount of moisture it can hold. A second important fact that was discussed (and is illustrated in Appendix 16) is that at a given temperature, slightly more water vapor can be held over a water surface than over an ice surface. It is easiest to consider the contrails laid down by commercial jets that commonly fly from 10 km to 13 km (32,800-42,600 ft.) where the temperatures ranges from -30°C to -65°C ( —22°F to — 85°F). This is the region of the high troposphere or the low stratosphere, it takes very little water at these temperatures to produce a condition of saturation or supersaturation. Between these extremes lie all the possibilities for the many variations in pattern that occur. Moisture at high elevations often advances through the sky in tongues or uneven patterns, both large and small. Thus contrails may be seen in uneven segments of growth and dissipation. Sometimes the multiple contrails that persist will break into a series of swirled loops, with the loops joining into ovals. When these loops and connected vortices develop, they ordinarily do not last more than a minute or so. When trails last for longer periods. they may break into a series of pendules or fingers. The pendule is a form of ring vortex, indicating the presence of locally stable moist air. Sometimes pendules are pulled away into long streamers by a zone of faster moving air. The resulting shear motion may result in such an extensive cloud sheet that the sky becomes completely overcast. Contrails are spectacular in early morning and evening, and even in the light of the full moon. When the air to the west is clear and the sun has set, a jet aircraft at 12 km (about 40,000 ft.) will still be illuminated by the sun. Sometimes the white contrail will assume a brilliant red or orange color. To the uninformed, the moving trail, produced by a plane that is invisible or appears only as a rapidly moving spot in the sky. may seem to be an out-of-this-world apparition. More than one such case has subsequently been headlined in the papers as a UFO with a fiery tail. Under most conditions a contrail is made of ice crystals. Though it initially consists of liquid water droplets in the warm exhaust air, these soon change to ice particles in the frigid temperatures of the high atmosphere. 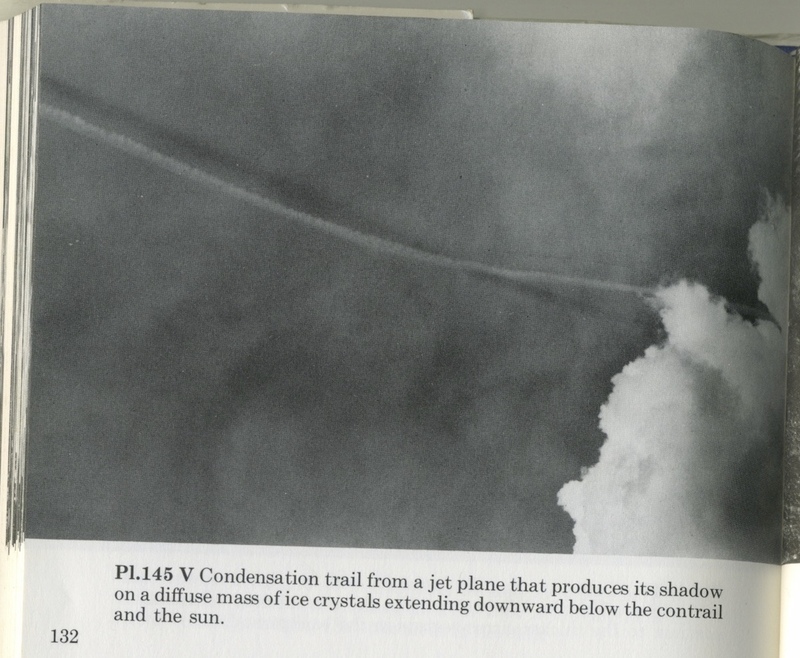 The presence of ice is best illustrated when the contrail is located between the observer and the sun. Bright areas called parhelia (see Color Plate 11) are visible at an angle of 22° on either side of the sun. This angle can easily be checked with a built-in device possessed by every human. With arm and fingers outstretched, let the thumb obscure the sun. The little finger, stretched to the maximum, then subtends an angle of about 22°. The bright spots observed are a portion of the well-known 22° halo (see p. 158). The jet aircraft disturbs its environment in 2 important ways. First, a jet engine consumes large quantities of fuel, and substantial amounts of water vapor, a major by-product of combustion, leave the engine as one component of the exhaust gases. Second, the rapid movement of the air over the wings and body of the aircraft generates vortices that persist for a time until their internal energy is dissipated. The particular contrail pattern will he determined by several interacting factors. These are: (1) the moisture content of the air, (2) the temperature of the air, (3) the moisture introduced into the air by the engines (4) the vertical stability of the air below, at, and above the aircraft. (5) the cloud condensation and ice nuclei count when the air is warmer than -40°C (-40T), and (6) the mixing that takes place between the environmental air and the exhaust. At one extreme, the air through which the jet is flying might be gently sinking over a large area, and thus have a very low relative humidity. In this case, the addition of moisture might be insufficient to produce anything but a very short-lived contrail, quickly destroyed by mixing with the dry surrounding air. When a jet passes and leaves no contrails in the sky, or contrails that quickly disappear, this is a good prognosticator of fair weather. At the other extreme, the jet flies through air that is gradually rising and becoming cool, and so may be nearly saturated. The addition of moisture from the jet exhaust may then be enough to produce saturation and consequent water drops or ice crystals. A persistent trail is an indicator of moist air, which may be the first sign of an extensive storm area moving into the region. This is particularly true when cirrus clouds are also present. 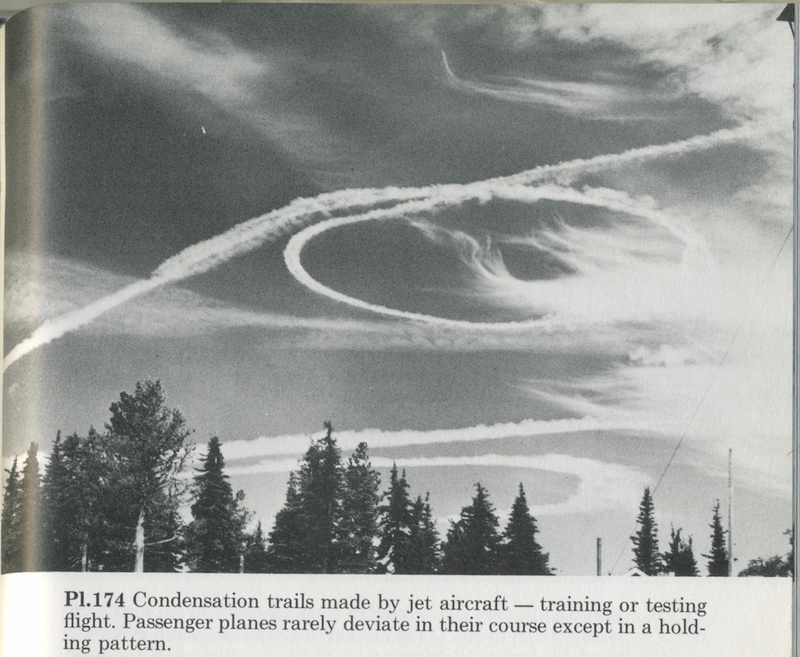 And while other books have a better selection of photos, those in the Fields Guide are also very useful illustrations of some of the "chemtrail" misconceptions about contrails. So if you've got a friend who is interested in chemtrails, then I can highly recommend that you get a copy of this book to show to them. Looks great. And very obviously pre-dates the chemtrail theories that popped up in the 90's. I have the Peterson guide in hardcover. I emailed some text and photos to my chemtrail-believer sister. They made no impact whatever. Her retort was that the book's publication date and dates of the photos simply means that the chemtrail work has been going on longer than we ever thought, and that the 90s were simply when the conspiracy was discovered and disseminated to/by the public. It would seem that no matter what facts or physics I might throw at her, her belief is as steadfast as that of a religious zealot. She always has a comeback response, she cherry-picks information to bolster her belief, she declares that good information is a lie or is invalid, or she simply ignores information entirely. Her confirmation bias makes it impossible to convince her. What rankles me is that she is otherwise intelligent and reasonable. And it isn't just chems that she's into—she also holds beliefs in associated conspiracies of the Illuminati, Freemasons, Zionists, Gates Foundation eugenics, Obamacare Death Panels, 9-11 Was In Inside Job,—you name it. How do people get consumed in such things? Her interest started as an entertaining curiosity—she didn't believe this stuff at first. Followup: I looked at some psychology websites trying to get some information about conspiracy theorists and what drives them. Apparently, there is actually an addiction associated with this. Maybe that is what is going on with my sis—I don't know. Discouragingly, there seems to be a consensus that simply throwing factual information and reasoned scientific explanations at my sister won't work—anymore than it works to convert someone away from their religion. I don't know what else I can do, though. I don't know, maybe I should just leave it alone and let her live her life in a pit of fear and suspicion? Psychology is a piece for another thread (because it could REALLY go on) but from my experience, the vast majority of people that get into the theories do it out of fear or a feeling of lack of control in their lives. As scared as it makes them, its easier to comprehend and digest if there's a super villain making the world miserable vs random chaos. Our minds have evolved to recognize patterns, they LOOK for patterns.. so much so that they find patterns where patterns dont always exist. In a lot of cases, its a coping mechanism. In others, who knows. Some conspiracies do exist.. any time you have more than two people working in concert for illegal means, its a conspiracy.. but as to conspiracies on the levels so many ppl attribute things.. I dont want to say its impossible, but the levels of cooperation would be mindbogglingly huge. You have to ask yourself.. is this even feasibly possible? For Chemtrails and the like, we're talking cooperation hundreds or thousands, if not 10s of thousands of times higher than The Manhattan Project.. and that was HUGE. The easiest way to reach people who havent completely tumbled down the rabbit hole would be to ask them to think about the size of the conspiracy.. How many people would have to be involved? Every country with a commercial aircraft fleet would have to be in cahoots. Could India and Pakistan cooperate on that level? Hell no.. what about Israel and Iran? North and South Korea? Nope. How many average people would have to be involved? All the employees working the tarmac would have to be in on it, the fuel trucks, fuel companies, baggage handlers... You think people that barely make a living working for airlines would be able to keep their mouths shut if they found a conspiracy like this? hell no..theyd blab just so they could get their own TV movie about being "The whistleblower that brought down the NWO" or the Illuminati, or whoever the badguy of the week is. Get rational with her, keep your cool, be polite and do what Mick and the others here do.. for every claim she makes, ask her to provide you with evidence that ISNT from Social Media or YouTube. She might start to come around. The easiest way to reach people who havent completely tumbled down the rabbit hole would be to ask them to think about the size of the conspiracy. Thank you for your suggestions. they make me feel like I don't have to give up on her yet! Please remember there are lots of different people out there. Some of them are more fixed in their beliefs than others. We can't make general sweeping descriptions that apply to all people with an interest in "chemtrails" - especially when a description might seem offensive to people it does not apply to (or even to people it does apply to). Consider there are many people here on this board who are former believers. They are real people who were once in the position you might now feel is derisible. There is no reason not to treat the current believers with as much respect as you treat the former believers. This thread is meant to be helpful to chemtrail believers, and to their friends and family. But in order for people to listen to what you are saying, then you have to treat them with respect. And remember, this is Metabunk policy. I feel your pain, and applaud your effort to right the ship...I'm not sure I'd be up for it, myself. with the overwhelming majority of those who do preach chemtrail theory, or at least believe in it. A small percentage, yes. But still quite possibly numbering in the hundreds, or more. But yes, most chemtrail believers are simply suffering under the misconception that contrails can't persist, and that persistent trails are something new. This book disproves that. It's also quite hard to imagine exactly how a conspiracy could incorporate this book (and the other books), so even though it might be flippantly dismissed by that minority of people with "oh, they have been doing this for years", I think it's well worth pressing them to actually explain how that would even work. But yes, most chemtrail believers are simply suffering under the misconception that contrails can't persist, and that persistent trails are something new. I usually just ask them who told them that and why they believed it. They never answer. But for some people you might have actually planted a seed of curiosity. Suggesting people "look it up" is a good thing. Asking them (politely) where they got their information is really a different way of wording it. Agreed, simply saying "look it up", sounds a lot like "Do the research!" - that famous catch all CTs use for avoiding having to present the evidence themselves. Engaging them in a discussion about the sources is very productive and if you have your research well cataloged in your own mind, you will have the upper hand already. because you can be sure that the catalog of theirs is drowning in CT white noise. What I have learned, in the case of a few of my own CT acquaintances, is that when you present a great deal of evidence against a prevailing theory and it's overwhelmingly accurate and thoroughly researched you might still not see the epiphany you're looking for in the CT. More likely, out of pride, the CT may come away from the conversation with the info nagging at them until they cognitive dissonance the whole thing away. You might never hear that person vocalise the theory or post about it. It is effectively done away with as the theorist moves to other theories that have not yet been refuted. What the Vox article posted earlier suggests is that info has a way of shutting the door on it's way in. So the first ideas that get seeded stick like glue and debunking becomes difficult because it is always going to be the second info. This book on contrails is very helpful because it at least places correct weather knowledge ahead of the theories in a timeline of literature. You can now say, "I hear you and I respect your opinion. Can you please find me a source that documents chemtrails earlier than this source so I can compare?" Unfotunately that does sometimes result in 10 Youtube videos on your facebook feed. Sigh. Yes, right back to old "smoke screen" videos from the first world war! It can become a never-ending battle. Looks great. And very obviously pre-dates the chemtrail theories that popped up in the 90's. Of course, this could all be an elaborate pre-emptive hoax by the Illuminati you know. What's the connection between that and contrails? Nothing at all to do with contrails. And misrepresented. The spraying of cadmium sulfide was not to test the health effects of the compound (which is a well-studied compound, used as a tattoo pigment). It was to study wind dispersal patterns to provide data in case of a real chemical or biological weapon attack. That article has ao many red flags it should be leading a parade. Harmless in quotes? Check. Implication that only poor people were sprayed? Check. Image with "nuclear" on the bottle. Yep. Says "revealed" when the research was on "unclassified documents" and there was a government study done on the health effects in 1997? I'll stop now. She seems to have latched on to the fact that a radium compound was apparently added to the mixture to improve it's flourescence. Radium is part of the decay chain from Uranium to Radon, and is therefore naturally found at low levels in the environment. It's unlikely that its aerial dispersal would even show up unless it was used in enormous quantities. The article implies heavily that a radioactive material was "added" in addition to the Zinc Cadmium Sulfide, but fails to actually provide evidence in the form of a photo or testimony to that effect beyond what the author claims. Her knowledge being Tertiary Evidence at best. And this article doesn't suggest at all that the phenomenon of contrails was at all a signature of the aerial spraying. Only that it was sprayed from planes. There are no photos of what the spray trails looked like, but I'll be they didn't look like contrails. Really, it only shows that the US Army used a safe chemical during secret tests, designed to understand the effects of a possible enemy chemical or biological attack. So this isn't pre-1990 'chemtrail' evidence at all. It is indeed. I somehow missed that non sequiter in the linked article. Ugh. She seems to have latched on to the fact that a radium compound was apparently added to the mixture to improve it's fluorescence. Yes, and it was always the harmless Zinc Cadmium Sulphide that was chosen for fluorescence. It's as if these 'authors' don't actually read through their work before submitting stuff or don't ever intend to link claims to verified evidence. Hmmmmm.... A United Nuclear container. Coincidence? Or did Lazar use his time bending space probe to travel back in time to sell Cadmium Sulfide to the US military? I realized that the army used Zinc Cadmium Sulfide for its flourescence and assumed if they added a radium compound it was as an enhancer. I just missed the leap from FP2266 to Radium 226. It appears that US Radium's Undark paint did flouresce from the combination of Radium and Zinc Sulfide, one of the two constituents of Zinc Cadmium Sulfide, which lends plausability to the theory. This is not to say it is true, however, as it's entirely likely the materials purchased from US Radium were Zinc Sulfide without the radium added. The radium in Glow in the dark paints like Undark triggers the flourescence, which would not work if they weren't confined in the paint matrix and really wouldn't be desirable anyway. Who wants secret military tests that make peoples houses look infested with glowworms? 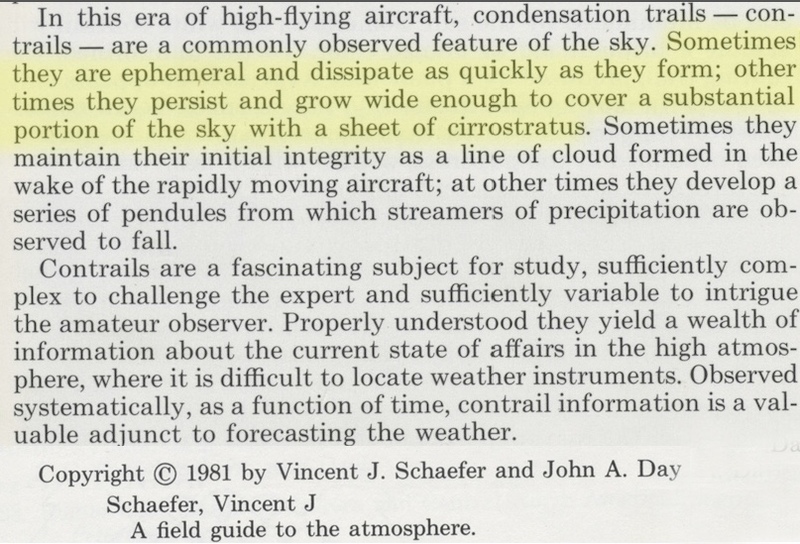 While the book is before the 'chemtrail theory' emerged, i think the main point of this is the science of CONTRAILS. There are older books if you're trying to argue 'chemtrail theory' from that perspective. Continuing the sidetrack, zinc cadmium sulfide is fluorescent by itself. You don't need to add anything, radioactive or not, to make it fluoresce. Right. But Radium allows it to flouresce in the absence of other UV sources. Its the difference between glow in the dark that fades after the lights go out and shining UvB on Uranium glass. Yes, I think we all agree on the following as it pertains to the experiment: Zinc Cadium Sulfide was used for the US Army experiments in question. Radium has fluorescent properties. There is no evidence that any other substances (radioactive or otherwise) were used. Zinc Cadium Sulfide is harmless. That also means that this report is not evidence of chemtrail conspiracy theory preceding the publishing of the weather field guides listed in the OP. That's luminescence not fluorescence though surely? Both, actually. Flourescence is a form of lumenescence. It refers specifically to lumenescence due to reradiation. The decay of Radium gives off high energy photons that are absorbed by the Zinc Cadmium Sulfide, and reradiated at visible wavelengths. But it is named for Flourite (CaF2) which flouresces fairly strongly under UV. Indeed. Both fluorescence and fluorine (and therefore fluoride etc) take their names from fluorite. And fluorite gets its name from the Latin fluo (flow), because of its use as a flux in smelting. Fluorite was named long before the words fluorescence or fluorine were coined. But, sadly, they still CLAIM it is part of the continuum of nefarious deeds, done by an evil government, all leading up to, and proving "CHEMTRAILS". Hello and Thank you Mick for your posts. I have been troubled about my friends, who I love and are good people, becoming more adamant in their assertions of "Geoengineering". I want to treat them with kindness and respect and very much appreciate that approach here. I wonder if there is a cogent point-by-point debunking of this Conspiracy that follows the same guidelines of kindness and respect. I'd start by showing them this book, and discussing the points in the extract above that they disagree with. I don't think this would make much difference to many of the chemtrail believers I've spoken to. Like the person above's sister, they will just find some way to dismiss it as disinformation. It'd be like trying to get a creationist to accept evolution by explaining the evidence. It will only work on ones who are already experiencing doubt. It's something to be understood at a psychological level. At the risk of sounding uncharitable, I suspect many are compensating for feelings of inferiority. This allows them to believe that they have access to information that most people (the Sheeple) are simply unable to perceive. I've had it explained many times that I am "programmed", always by people who have been completely unable to respond to my objections to the chemtrail theory: the fact that contrail science explains everything that is observed and was established decades before chemtrails were first mentioned (I gather in 1996), the implausible size of the conspiracy, the loading of commercial airliners with chemicals right under the noses of passengers, the fact that the pilots and others involved would suffer all the same ill effects as the rest of us, as would their families, the lack of any solid evidence (samples or documents)...it really is one of the most implausible conspiracy theories out there. I don't think this would make much difference to many of the chemtrail believers I've spoken to. But it does make a difference to some of them - the people new to the theory, or people who are already questioning. And it's quite possible that all will do is plant a seed. Something that might eventually grow and crack the walls the true believers build around their beliefs. This allows them to believe that they have access to information that most people (the Sheeple) are simply unable to perceive. This is key, in my experience.